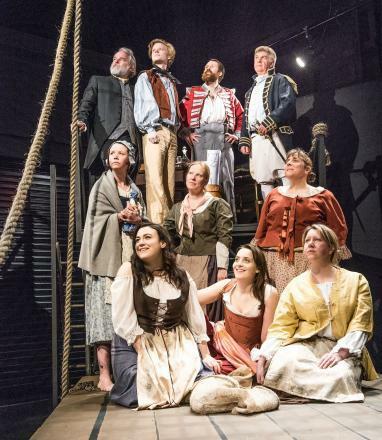 “You certainly can’t accuse the Studio Theatre of shirking from a daunting production. Set in the bowels of a ship transporting women convicts from England to Australia at the start of 19th century, Female Transport doesn’t skimp on all the misery you’d expect from a six-month journey such as this. Mostly chained by an ankle to their beds, the six female characters at the heart of this drama are powerless on the face of it. But the dog-eat-dog starting point evolves as the story charges grimly on, and we see the women pool what little power they have to forge what limited boundaries they can against the men who run the ship. On opening night, it was badass Nance (Samantha Luckman) who best expressed this transformation. Male characters deliver some historical context, and act in predictably greedy, cruel and spineless ways. In Steve Gooch’s raucous play we share a six month voyage aboard HMS Juliana with a group of female convicts, under the ‘care’ of a Surgeon (Anthony von Roretz) whose concern for the inmates is paper thin, the aloof but canny Captain (Colin Hayman), and the cruel and sadistic Sarge – a frightening performance from James Paterson. It seems some audience members have found the swearing this play contains hard to take but this, along with the many layered, precarious looking set (by Tim Greathead and Studio members) adds to the frenzied atmosphere of the piece, so that any moment of honesty, humour or passionate feeling becomes more moving. Tim Greathead’s cast acts with honesty and commitment, with a fine performance from Samantha Luckman as Nancy, Sally Marshall’s singing and acting as Madge, Sophie Townsend’s fragile Pitty, and three promising debuts – Elisabeth Roberts’ Winnie, Marie-Claire Wood’s intriguing but underwritten role, Charlotte, and great work by Eleanor Boag as the mercurial Sarah, who attracts but proves too much for young crewman Tommy (Teddy Woolgrove). This entry was posted on April 18, 2016 by salisbury_matt in reviews.